As the second installation of Straight Trippin’: Getting to know Julian, I wanted to highlight a few places within town that are worth a visit. Starting with some lunch at Julian Cafe & Bakery, one of the oldest establishments in town. 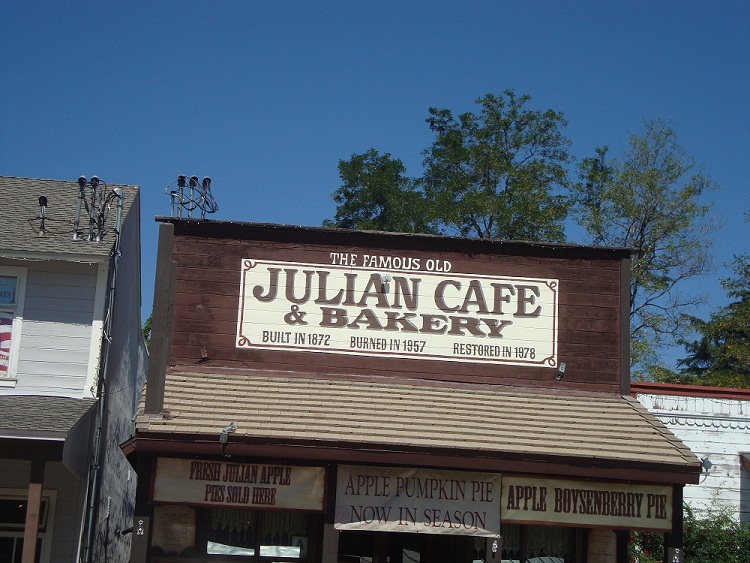 This cafe and bakery is said to have put Julian’s apple pie on the map, however, it didn’t quite make the cut in my apple pie showdown. It’s their old-fashioned approach to food that keep the crowds coming. The boyfriend and I decided to indulge in some country-style cooking. A backyard burger for him, and some country fried chicken for me. For the price, portions were generous and the food (although a little rich), was hearty and satisfying. 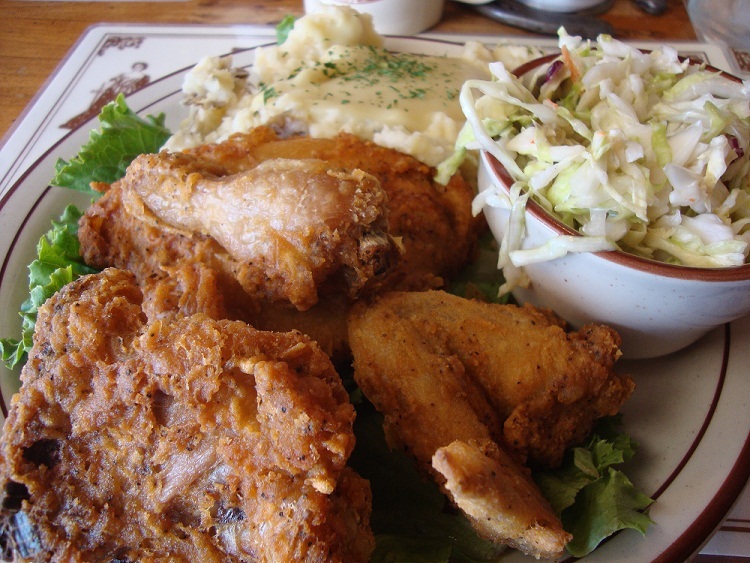 The fried chicken was tender and juicy; the batter tasting exactly like how I like what I call “diner” fried chicken. The meal came with homemade garlic mashed potatoes and cole slaw on the side-the former being very good and the latter being a little too sweet for my taste. After lunch, we walked around the corner onto B Street, which is considered “off the beaten path” for most visitors. Julian Cafe & Bakery had opened up a gift shop on B Street and after dining at the cafe, they gave us a coupon for a free gift. Assuming there would be a catch, we were curious anyway and made our way to see what the gift would be. 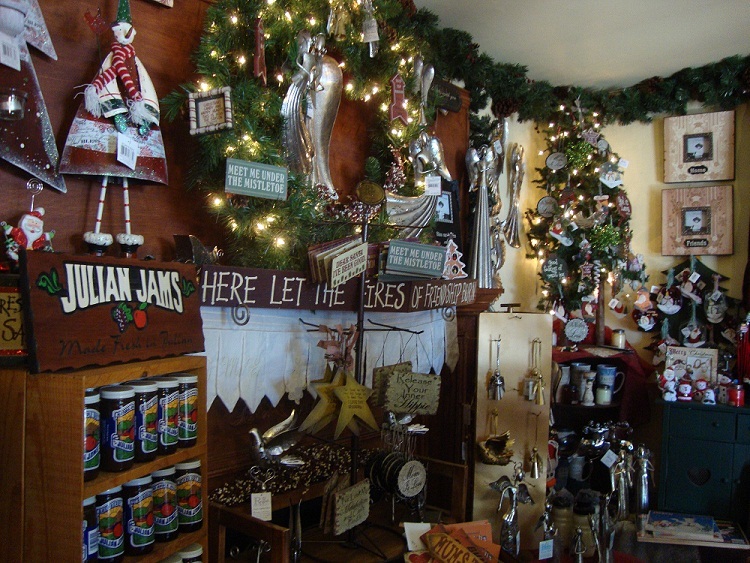 Surprisingly, we found that the shop was an adorable little place filled with holiday ornaments and trinkets. Meet Me Under the Mistletoe reminded me a bit of the Jule Haus in Solvang and the free gift actually was a free gift. We got to have our choice of handmade door hangers (gift changes daily). We also ended up buying some Julian Pumpkin Butter and a Christmas ornament, too. Further down B Street, you’ll find the Old Well. Julian’s local record store. This place is tiny and the selection is limited, but for a small town, it’s nice to know that you can find some old vinyl records and hang out in a small shop that literally houses the town’s old well. Walking back down to Main Street, we walked into the Julian Cider Mill. Quite possibly one of the major highlights of the trip, the Cider Mill isn’t an old industrial cider mill, but is a shop that houses many locally made jams, mustards, candies, and sauces. 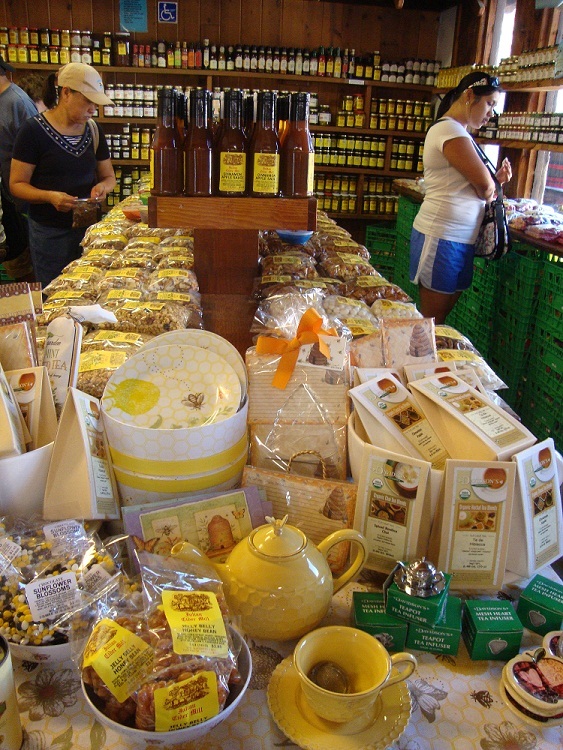 The selection at this shop was mind blowing…from their collection of preserves and honey to their locally made snacks. 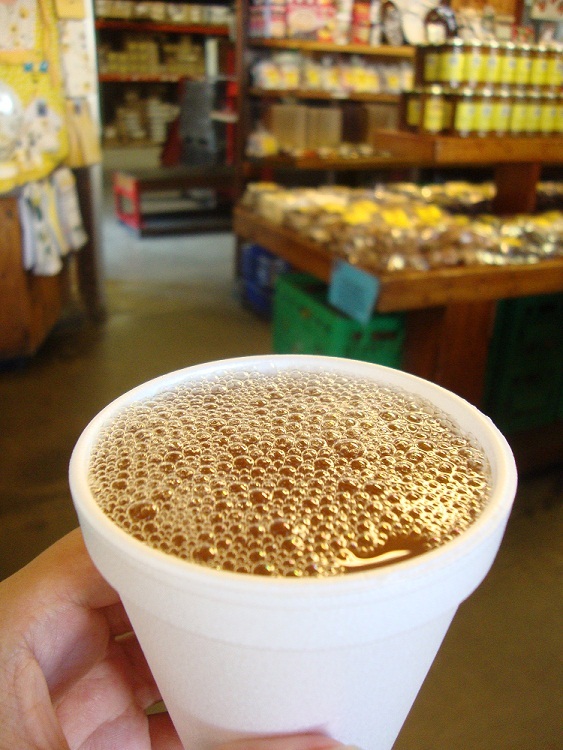 I was a fan of their generous samples and their $1 cups of delicious apple cider. 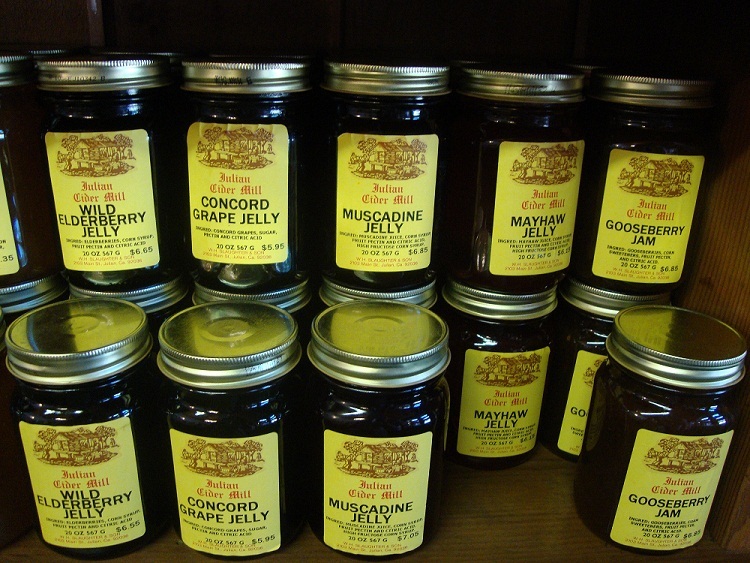 Wild Elderberry, Muscadine, Mayhaw, and Gooseberry Jelly!? 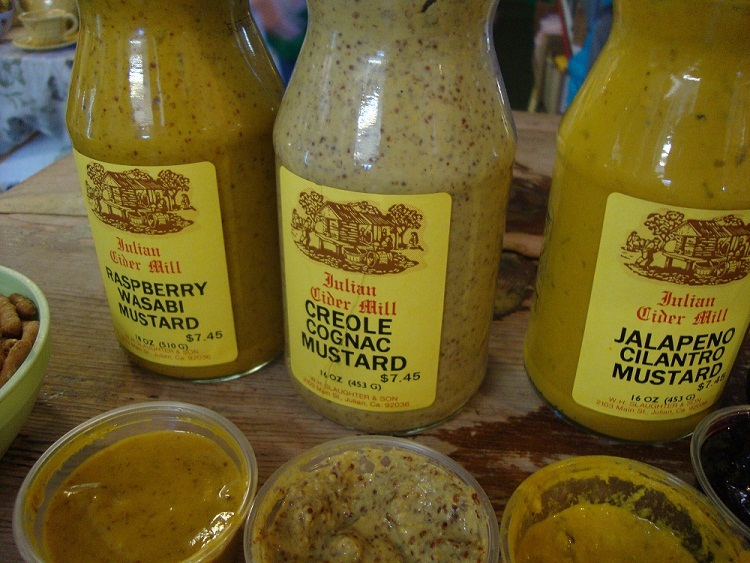 Raspberry Wasabi, Creole Cognac, and Jalapeno Cilantro mustards! 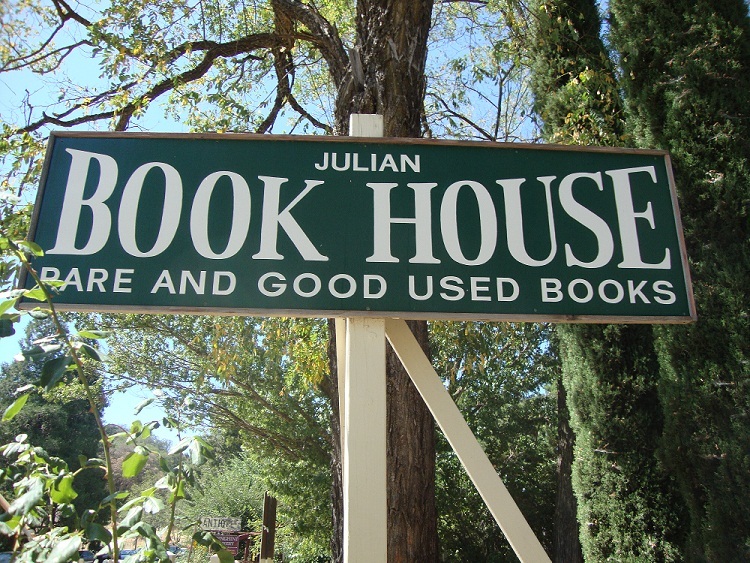 Further down Main Street, where Main turns into Farmer, we stumbled upon the Old Julian Book House. I love book stores and this one was definitely a gem. Husband and wife retired teachers moved here and bought the 29 year oldbook house in order to keep it from going under in 2003. Room after room of floor to ceiling books ranging from every subject you could think of. Vintage titles tocontemporary finds. A great selection of rare and old books dating back to the late 1800s at prices cheaper than you can find on eBay. Quaint, welcoming, and amazing. 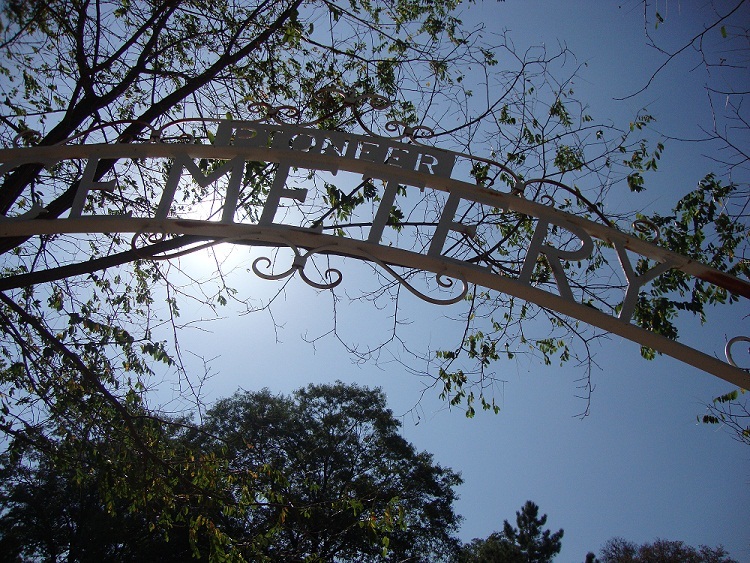 Just a little way’s up the road from the Book House is the Pioneer Cemetery. Perched up on a hill, this cemetery has been here since the pioneer days during the Gold Rush and is still currently in use. 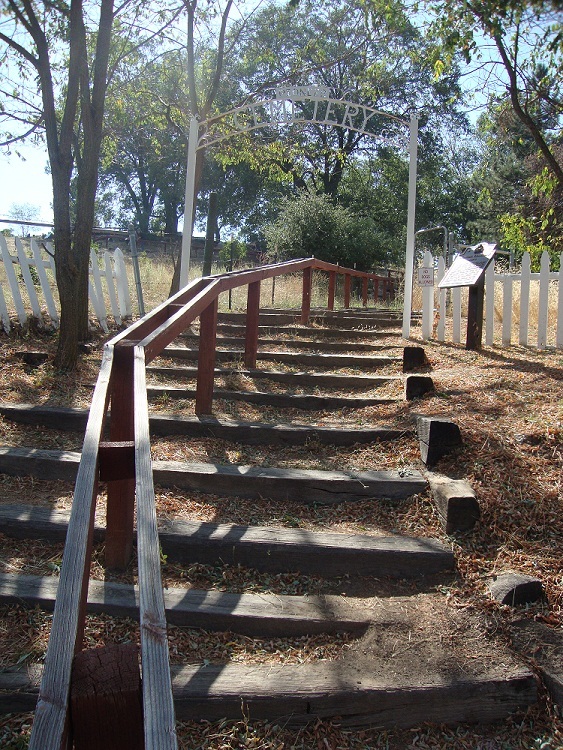 To get to the cemetery, you must hike up some crooked wooden steps which was once the “casket walk.” I can’t even imaging carrying a casket up those steps and having the body accidentally fall out, which is something that is said to have happened on occasion. The graves here were interesting because they weren’t in near rows…but more randomly distributed. Definitely odd to see a modern grave from the past couple of years just kind of placed in a random spot. An interesting place to walk around and get a feel of some of the town’s history and to get a glance at an escalated view of the mountain. Stay tuned for Part III: Apples, Pears, and more Apples.